A research team led by Raymond Lund, Ph.D., Professor Emeritus of Ophthalmology, and Trevor McGill, Ph.D., Research Assistant Professor at the Casey Eye Institute, Oregon Health and Science University have made a remarkable discovery using proprietary stem cells from StemCells, Inc. These results await publication in the European Journal of Neuroscience, and constitute positive preclinical data for StemCells, Inc. proprietary Human Central Nervous System Stem Cells (HuCNS-SC). For these experiments, the team used Royal College of Surgeons (RSC) rats. RCS rats have an inherited form of retinal degeneration. Although the genetic defect that causes retinal regeneration was not known for many years, it was identified in the year 2000 to be due to a mutation in the Merkt gene. 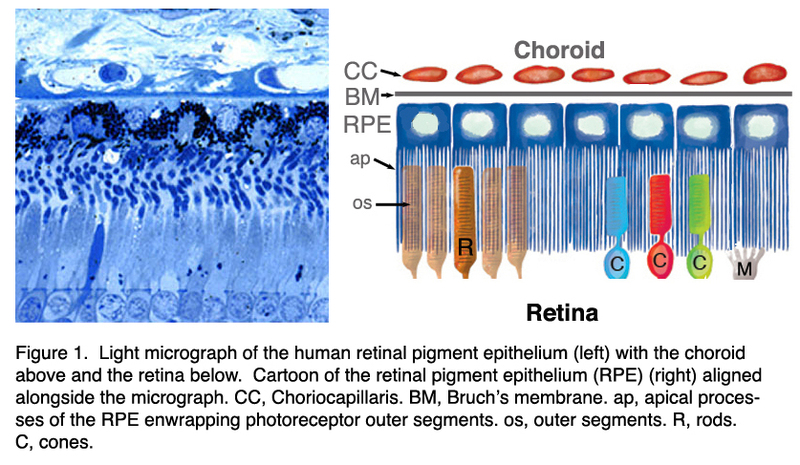 Mutations in the Merkt gene prevent the retinal pigment epithelium cells from scooping up outer segments of photoreceptor cells. As photoreceptor cells respond to light, their outer membrane proteins suffer photo-oxidation. Retinal pigment epithelial cells phagocytose these defective photoreceptor outer membrane segments and recycle them, which maintains photoreceptor health and function. When retinal pigment epithelium cells are unable to phagocytose photoreceptor out membrane segments, the photoreceptors accumulate photo-damage and eventually die. To test the efficacy of HuCNS-SCs in preserving photoreceptor health, Lund and his colleagues injected HuCNS-SCs into the subretinal space of 21-day old RCS rats. They found that photoreceptors, the key cells of the eye involved in vision were protected from degeneration. Additionally, the density of healthy cone photoreceptors (those photoreceptors that help in color perception) remained relatively constant over several months. Visual acuity and luminance sensitivity tests in the injected RCS rats further corroborated the results of observed in the retinas. Apparently, the donor cells remained immature and did not differentiate throughout the seven-month experiment. However, the transplanted HuCNS-SCs underwent very little proliferation, and produced no tumors or abnormal growths. The ability of these transplanted cells to protect photoreceptors and preserve vision when injected into the retinas of RCS rats is important to human disorders of vision loss such as dry age-related macular degeneration (AMD). Wesley Smith at his blog notes that the California Stem Cell Report, which will include public testimony to the Institute of Medicine (IOM), an arm of the National Institutes of Health (NIH), will include scientists who were awarded lucrative grants by the California Institute for Regenerative Medicine (CIRM), but no critics of the program. His source is a very critical Los Angeles Times article. CIRM’s 29-member oversight committee includes representatives from institutions that have benefitted from grants the committee approved. This structure, along with overly long terms and the inability to nominate its own leaders or hold them accountable, fuels concerns that the committee never can be entirely free of conflict of interest or self-dealing, notwithstanding a court ruling that established the legality of such a structure. Legal is not necessarily optimal, however, and litigation over this issue delayed CIRM from beginning its work. As long as the board remains in its present form, its structure will draw scrutiny, diverting CIRM resources. No representatives from either of these critical institutions are on the witness list. Why aren’t members of the public allowed to address the IOM? According to the LA Times, the proprietor of the California Stem Cell Report, David Jensen, says he asked the IOM why no objective witnesses were on the hearing list, and an IOM public relations person directed him to a survey form members of the public could fill out (though the link for the form on the IOM’s website was dead when I checked it). Apparently, members of the public will also be permitted to address the IOM panel at Tuesday’s hearing. They’ll each get up to five minutes. CIRM is selling the people of California a bill of goods. In 2014, CIRM will be back to the people of California with their hand out for more money. If the process is so objective, then what do they have to hide? 3 billion dollars later and little to show for it except for lots of dead human embryos. People will be more than a little miffed; and they should be. The APOLLO Clinical trial is derived from its longer title: A Randomized Clinical Trial of Adipose-derived Stem cells in the Treatment of Patients with ST-elevation myocardial Infarction. The APOLLO trial is being funded by the National Institutes of Health and Cytori Therapeutics. The study participants are Alexander Milstein MD at Cytori Therapeutics, Patrick Serruys MD PhD at Erasmus University Medical Centrum in Rotterdam, Netherlands, and Hospital General Universitario Gregorio Maranon in Madrid, Spain. Goal of this clinical trial is to test the efficacy and safety of adipose tissue-derived stem cells to improve the heart function of patients that have experienced a heart attack. 14 patients were initially enrolled in the APOLLO trial and it is a randomized, placebo-based, double-blind safety and feasibility trial (Phase I/IIA) that uses a patient’s own fat-based stem cells that have been isolated from liposuction aspirates. Recently, the six-month outcomes of this experiment were published in Journal of the American College of Cardiology. All patients in the APOLLO trial had experienced a heart attack and underwent liposuction of abdominal fat. Each patient’s fat cells were processed by the Celution System. This system extracted the stem cells from the surrounding fat cells and concentrated them into a syringe of clinical grade cells. All patients were treated within 36 hours after the heart attacks and 10 patients received an injection of 20 million Adipose-Derived Regenerative Cells and 4 of them received a placebo. The findings are encouraging. There were no side effects from the stem cell treatments, and no increase in cardiac arrhythmias. Patients that had received the stem cells showed improvement in cardiac function as ascertained by single-photon emission computed tomography SPECT, Furthermore, stem cell-treated patients showed improved blood flow into the heart, and an 11% decrease in the size of the heart scar. Also, these positive results were also seen in the 18-month examination as well. Those patients that received the placebo showed no such improvements. Scientists from the University of California, San Diego School of Medicine, have created stem cell-derived, in vitro models of sporadic and hereditary Alzheimer’s, using induced pluripotent stem cells from patients with the neurodegenerative disorder. This experiment provides the ability to study the precise abnormalities present in neurons that cause the pathology of this neurodegenerative disease. Goldstein and colleagues extracted skin cells called fibroblasts from skin tissues from two patients with familial Alzheimer’s disease. They also used fibroblasts from two patients with sporadic Alzheimer’s disease, and two persons with no known neurological problems. They reprogrammed the fibroblasts into induced pluripotent stem cells (iPSCs) that then differentiated them into working neurons. These iPSC-derived neurons from the Alzheimer’s patients exhibited normal electrophysiological activity, formed functional synaptic contacts and displayed tell-tale indicators of Alzheimer’s disease. Also, they possessed higher-than-normal levels of proteins associated with Alzheimer’s disease. Neurons derived from one of the two patients with sporadic Alzheimer’s disease showed biochemical changes possibly linked to the disease. Thus there may be sub-categories of the disorder and, in the future, potential therapies might be targeted to specific groups of Alzheimer’s patients. Laboratory research needs tissue as a model system. Smooth muscle is found in the urogenital system, circulatory system, digestive system, and respiratory systems of the human body. Various diseases affect smooth muscle and being able to work on cultured smooth muscle would greatly advance the ability of medical researchers to find treatments for smooth muscle disorders. To address this need, Cambridge University scientists have devised a protocol for generating different types of vascular smooth muscle cells (SMCs) using cells from patients’ skin. This work could lead to new treatments and better screening for cardiovascular disease. The Cambridge group used embryonic stem cells and reprogrammed skin cells. Skin cells were turned into induced pluripotent skin cells (iPSCs), which were then differentiated into SMCs. They found that they could create all the major vascular smooth muscle cells in high purity using iPSCs. This technique can also be scaled up to produce clinical-grade SMCs. The scientists created three subtypes of SMCs from these different types of stem cells. They also showed that various SMC subtypes responded differently when exposed to substances that cause vascular diseases. They concluded that differences in the developmental origin play a role in the susceptibility of SMCs to various diseases. Furthermore, the developmental origin of specific SMCs might part some role in determining where and when common vascular diseases such as aortic aneurysms or atherosclerosis originate. Human pluripotent stem cells represent a tremendous potential for human treatment, but the mutations introduced into these cells during their derivation renders the safety of these cells questionable. Some French researchers have even generated some cautionary data that suggests that additional quality controls are needed to ensure that neural derivatives of human pluripotent stem cells are not genetically unstable. Such cells are currently being tested in clinical trials, and there is a need to ensure that they are genetically sound. Human stem cells capable of giving rise to any fetal or adult cell type are known as pluripotent stem cells. It is hoped that such cells, the most well-known being human embryonic stem cells (hESCs), can be used to generate cell populations that can be used in therapeutic regiments. Presently, neural derivatives of embryonic stem cells are being tested in clinical trials. Nathalie Lefort and colleagues at the Institute for Stem cell Therapy and Exploration of Monogenic Diseases (France) have shown that neural derivatives of human embryonic stem cells frequently acquire extra material from the long arm of chromosome 1 (1q). This particular chromosomal defect is sometimes seen in some blood cell cancers and pediatric brain tumors that have a rather poor clinical prognosis. Fortunately, when Lefort and her colleagues implanted these abnormal neural cells into mice, they were unable to form tumors in mice. Neil Harrison of the University of Sheffield (U.K.) has commented on Lefort’s work in an accompanying article that these data raise safety issues relevant for the therapeutic use of embryonic stem cell derivatives. The fact that the same chromosome was affected in all cases suggests that it should be possible to design a screen that can effectively detect and remove genetically abnormal cells. Huntington’s disease is an inherited brain disorder that causes progressive uncontrolled movements, dementia and culminates in death. The symptoms of Huntington’s disease are involuntary jerking or writhing movements (chorea), involuntary, sustained contraction of muscles (dystonia), muscle rigidity, slow, uncoordinated fine movements, slow or abnormal eye movements, impaired gait, posture and balance, difficulty with the physical production of speech, and difficulty swallowing. More than a quarter of a million Americans are affected by Huntington’s disease. Huntington’s disease is passed through families even if only one parent has the abnormal huntingtin gene, since it is inherited as an autosomal dominant. The huntingtin gene is found on the fourth chromosome, and Huntington’s disease-causing mutations result from the expansion of a trinucleotide (CAG) repeat (Jones L, Hughes A. Int Rev Neurobiol.2011;98:373-418 & Reiner A, Dragatsis I, Dietrich P. Int Rev Neurobiol. 2011;98:325-72). This trinucleotide repeat is normally repeated up to 28 times on the chromosome, but polymerase slip during DNA replication can expand the number of these repeats so that an abnormal form of the Huntingtin protein to be made. The abnormal Huntingtin protein accumulates in the brain and this cause the disease’s devastating progression. Individuals usually develop symptoms in middle age if there are more than 35 copies of the CAG repeats. A more rare form of the disease occurs in youth when the number of CAG repeats occurs many more times. Huntington’s disease can be managed with medications. For example Terabenazine (Xenazine) suppresses the involuntary jerking and writhing movements associated with Huntington’s diseases. Antipsychotic drugs such as Haloperidol (Haldol) and Clozapine (Clozaril) can suppress movements but they can also increase muscle rigidity and involuntary contractions. Other medications like clonazepam (Klonopin) and diazepam (Valium) can suppress the chorea, dystonia and muscle rigidity. Even though brain grafts in laboratory animals have shown some promise, these experiments used a chemically induced form of Huntington’s disease. Because the surrounding tissue was genetically normal, implanted brain tissue simply integrated into the damaged brain tissue and healed it. However, clinical Huntington’s disease is due to mutations in the huntingtingene, and the surrounding brain tissue is not genetically normal. Therefore grafted stem cells are killed off by the toxic environment in the brain (Clelland CD, Barker RA, Watts C. Neurosurg Focus.2008;24(3-4):E9 & Dunnett SB, Rosser AE. Exp Neurol. 2007 Feb;203(2):279-92). To overcome this problem, researchers have developed a technique for that used stem cells to deliver therapeutic agents that specifically target the genetic abnormality found in Huntington’s disease. Scientists at the UC Davis Institute for Regenerative Cures have developed a novel, and promising approach that might prevent the disease from advancing. Jan A. Nolta, principal investigator of the study and director of the UC Davis stem cell program and the UC Davis Institute for Regenerative Cures, thinks that the best chance to halt the disease’s progression will be to reduce or eliminate the mutant Huntingtin (Htt) protein found in the neurons of those with the disease. RNA interference (RNAi) technology has been shown to be highly effective at reducing Htt protein levels and reversing disease symptoms in mouse models. The research team from UC Davis showed for the first time that inhibitory RNA sequences are directly transferable from donor cells into target cells to greatly reduce unwanted protein synthesis from the mutant huntingtin gene. To transfer these inhibitory RNA sequences into their targets, Nolta’s team genetically engineered mesenchymal stem cells (MSCs) from bone marrow that had been collected from unaffected human donors. Over the past two decades, Nolta and her colleagues have shown MSCs are safe and effective vehicles for the transfer of enzymes and proteins to other cells. According to Nolta, MSCs can also transfer RNA molecules directly from cell to cell, in amounts sufficient to reduce levels of a mutant protein by over 50% in the target cells. This discovery has never been reported before and offers great promise for a variety of disorders. Published – Scott D. Olson, Jan Nolta et al. ; Examination of mesenchymal stem cell-mediated RNAi transfer to Huntington’s disease affected neuronal cells for reduction of huntingtin;” Molecular and Cellular Neuroscience,2011; DOI: 10.1016/j.mcn.2011.12.001.